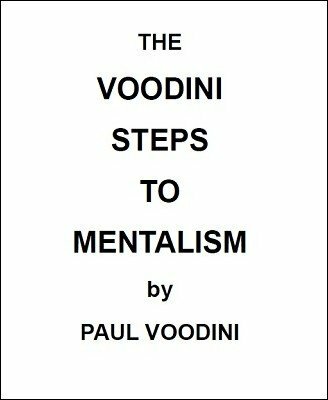 Paul Voodini presents The Voodini Steps to Mentalism , his own very personal take on the classic 13 Steps to Mentalism by Toni Corinda. Taking the original 13 Steps to Mentalism's chapter headings as his starting point, Paul takes us on a journey through his unique approach to mentalism and mind-magic. Packed full with routines and presentational ideas, The Voodini Steps also features real world performance advice and anecdotes from his time as a professional entertainer. With its emphasis very firmly placed in the real world of performance and entertainment, this ebook is a goldmine of practical information for both the professional and the enthusiast. There is much here to inspire and excite anyone with a passion for mentalism, mind-magic, and the esoteric. A lifetime's work encapsulated within 351 pages. This work was originally made available to people who subscribed directly with Paul Voodini for the individual steps, and is now available for general purchase for the first time. 1st edition 2015, 351 pages.